Good news for government job seeker's, Andhra Pradesh State Public Service Commission has lunched OTPR ( One Time Profile Registration ) system through their official website www,apspsc.gov.in, and also APPSC has launched a new website www.psc.ap.gov.in. Job seekers can Register their details on the APPSC portal, After completing the process on the portal, an OTPR id will be generated and sent to the candidate’s mobile number.This OTPR id is necessary to apply for any exams notified by APPSC and the candidates can pay the fees online or through cash in APonline (Mee Seva) centres, This will enable them to apply for multiple jobs. They won’t have to send separate applications for each job.OTPR facility is made available to the employees working in various departments that those aspiring to attend departmental examinations. 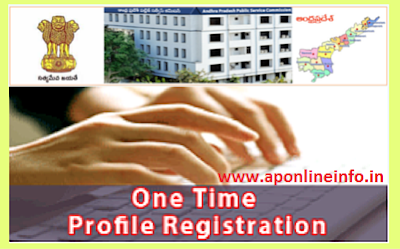 How to Register OTPR ( One time profile registration ) through APPSC Portal ? Step by Step Procedure for Register (One time profile registration ) through APPSC Portal. Click One Time Profile Registration link in home page of the portal. After clicking on One Time Profile Registration link, the following two links will be available. Click on Departmental Test for register in to Andhra Pradesh Public Service Commission portal. After Clicking on Departmental Test link, the following two links will be available. Click on Andhra Pradesh State Government Employees for register in to Andhra Pradesh Public Service Commission portal. After Clicking on Andhra Pradesh State Government Employees link, the following three links will be available. Using this screen Andhra Pradesh State Government Employee can register his profile with Andhra Pradesh Public Service Commission. Employee should fill in the form provided for OTPR (One Time Profile Registration) and after submission, Government Employee will get unique Reference ID to the Employee Mobile Number and Email Id. The Employee also gets different codes to his mobile and Email for checking the correctness of the mobile number and email id provided by him. Employee should keep this Reference ID, Mobile Code and Email Code (Sent to corresponding mobile Number and Email Address given) for Confirming the Registration. The confirmed Reference ID should be kept with the Employee for future correspondence. If in any case the Employee has entered wrong information, using this screen Employee can modify the information. If Employee has entered incorrect Mobile Number and Email Address, Employee won’t get Mobile Code or Email Code, in such a scenario using this screen Employee can edit the Mobile Number and Email Address then the Employee will get the Mobile Code and Email Code for confirming the application. Apart from Mobile number and email id correction, this screen can also be used by the Employee to update the fields in the form which he/she has wrongly entered. To confirm the Registration, Employee should enter Reference ID, Mobile Code, and Email Code and click on submit button. What should I do if I dnt receive mobile code even after clicking on resend messages? Dear sir I didn't get the mobile code even though I got E-mail code,how could I get it in order to confirm the registration?Please reply. Than Click on 'Resend' Button. Ya same problem.. tried many times but didn't received mobile code..
Sir Same prblm.. any solution.. pls rply.. me.. mobile code is not sent..
even after trying the 'resend' option, I didn't get the mobile code. What should I do now? SAME PROBLEM WHILE REGISTERING APPSC OTPR I DID NOT MOBILE CODE. Same problem i Have not received mobile code even after clicking resend code option. is there any other way to get the code or register? Seems some software problem is there ... Please rectify it..
we cannot use resend more than 2 times....and not getting mobile codes..
we cannot even re-register from start....Not getting mobile codes even if we are changing mobile numbers.. I received mobile code i had not received email code.. what should i Do??? AEE NOTIFICATION IS CLOSE SOON. . I WON'T GET MOBILE CODE ..I TRIED LOT. .. I DIDN'T ABLE TO APPLY FOR THAT JOB. . I didn't get mobile code and email code.......What i can do . I HAVE RECIEVED THE MOBILE CODE BUT I HAVENT GOT ANY MAIL CODE WHAT AM I SUPPOSED TO DO CAN ANY ONE HELP ME? At the stage of confirmation OTPR, I have entered all details but i am not able to see submit button, why? Sir am recive reference id and e mail code then what i do? Hello - Is there anyone to check these messages and get the issues sorted by responding to our posts. Issue : Have not received the Mobile or Email code, tried Resend also...nothing worked. Guide us, if there is any another way to get those. Your OTPR registered Mobile number might be wrong. Please check the same and update it. You can resend the SMS to your OTPR registered Mobile number for the maximum of two times using the Resend Messages option in Alerts tab in APPSC website. Still if you are facing any issues, Please go for a fresh registration with another Mobile number in OTPR. your OTPR registered e-MailID might be wrong. Please check the same and update it. OTPR ONCE REGISTERED SUCCESSFULLY IS TREATED AS CONFIRMED, NO FURTHER CONFIRMATION OF REGISTRATIONS IS REQUIRED. ALL THE OLD OTPR ID'S WHICH WERE NOT CONFIRMED ARE AUTO CONFIRMED BY THE SYSTEM AND THOSE APPLICANTS CAN DIRECTLY APPLY FOR DIRECT RECRUITMENT NOTIFICATIONS.